Here is the 4th season of What Have We Learned from Week 1 of the 2016 NFL Season, thanks to the AP Pro 32 for photos & help in this article. Despite Irma, football games in Florida get a go-ahead-Amid the misery in Florida caused by Hurricane Irma, the state still has places to play. The Jacksonville Jaguars were the latest to announce they will play at home this weekend. Team president Mark Lamping and Jacksonville Mayor Lenny Curry delivered the news at a local fire station Tuesday, just hours after the team returned home following an extended stay in Houston because of Irma. “It’s so important on so many different levels that we show the world that Jacksonville is open for business,” Lamping said. The Jaguars spent three nights in Houston because of the hurricane. 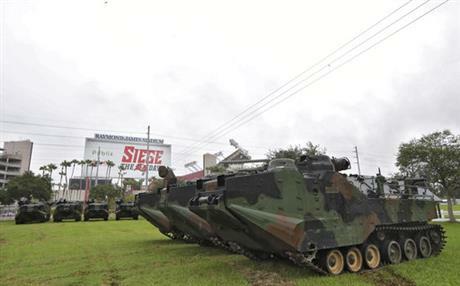 Lamping said EverBank Field in Jacksonville passed its final NFL inspection Tuesday to gain clearance to host a game. Stadiums in Tampa Bay and Miami also were declared safe after structural engineers found no damage related to Irma. The Tampa Bay Buccaneers will host the Chicago Bears as scheduled Sunday at Raymond James Stadium. It will serve as the Bucs’ season opener. “Hosting the game is important to us, as Tampa Bay has been through a lot over the past few days,” Buccaneers CEO Brian Ford said. The Bucs’ game last Sunday at Miami was postponed until Nov. 19 because of the storm. In college football, No. 22 South Florida was to resume practice Tuesday and will play host to Illinois on Friday, also at Raymond James. USF athletic director Mark Harlan said the Bulls determined their game could be safely played as scheduled without hurting recovery efforts. No. 23 Tennessee and 24th-ranked Florida will play as scheduled Saturday in Gainesville. Florida Field sustained only minor storm damage to signage. Florida (0-1) canceled its home opener last week against Northern Colorado because of the hurricane. Florida Atlantic targeted a Wednesday return to its campus in Boca Raton and hopes to play its scheduled home game Saturday against Bethune-Cookman. Hard Rock Stadium in Miami Gardens was determined to be safe for the Hurricanes, who are scheduled to play the next game there Sept. 23 against Toledo, and for the Dolphins. The Dolphins’ first game at the stadium will be Oct. 8. Their season opener scheduled at home this past Sunday was postponed until November because of the storm. Engineers inspected the stadium canopy that was part of a recent $500 million renovation and found no issues, despite fears of a tornado in the area spawned by Irma. The Dolphins’ practice complex has also been declared safe and will be available when the team returns from this week’s stay in California for Sunday’s game against the Los Angeles Chargers, Garfinkel said. Back in Jacksonville, the Jaguars and owner Shad Khan donated $1 million to Florida’s First Coast Relief Fund. The team also is giving away 5,000 tickets to the opener to first-responders and local residents affected by Irma. Cook upstages Peterson as Vikings turn the page at RB-Adrian Peterson spent more time watching from the sideline in his return to Minnesota than romping around the field, an introductory performance for New Orleans that became an afterthought once the Saints fell behind. With Dalvin Cook patiently waiting for space and bursting around the edge, the Vikings formally turned the page in the backfield with promising results. Sam Bradford started his second year with Minnesota in style, passing for 346 yards and three touchdowns in a 29-19 victory on Monday night by the Vikings that spoiled Peterson’s first game with the Saints. Booed by the crowd upon his first couple of mentions by the public address announcer, Peterson was limited to six carries and 18 yards in equal time with Mark Ingram and Alvin Kamara. The other members of the committee are more valuable in the passing game, though, so Peterson was hardly used after halftime. He was seen on camera at one point yelling at coach Sean Payton, a confrontation Peterson played down afterward. Peterson pinned his frustration on play calling that strayed from running inside, not at Payton for minimizing his use. The Vikings drafted Cook in the second round to fit their new zone-blocking scheme with a diverse skill set that could serve them well on passing downs, a snapshot of the evolution of the ideal NFL running back that Peterson was when he entered the league 10 years ago with his unique blend of power and speed. Though Cook bobbled a couple of the five passes thrown his way, he turned 25 touches into 137 total yards. The first Vikings rookie to start at running back since Michael Bennett in 2001, Cook carried the ball 22 times for 127 yards. He had 14 attempts for 105 yards in the second half to help the Vikings salt away the clock. His 33-yard scamper around right end on the first play of the fourth quarter would’ve been the team’s second-longest rush last season, and his total for the game bested the 2016 individual high for the Vikings by 36 yards. Cook spoke to Peterson afterward on the field, their first meeting. Ravens stellar defense ready to ‘chase perfection’-The Baltimore Ravens knew their defense was going to better this year, and their season-opening shutout of Cincinnati seemed to bear out that assessment. After forcing five turnovers and getting five sacks in a 20-0 rout, they still believe there is room for improvement. After the Baltimore defense wore down in the latter stage of the 2016 season, general manager Ozzie Newsome focused his attention on adding talent and depth to a unit that has long been the team’s calling card. He retained tackle Brandon Williams with a $54 million contract, signed free agent defensive backs Brandon Carr and Tony Jefferson and drafted cornerback Marlon Humphrey with the 16th overall pick. All four played pivotal roles in harassing Bengals quarterback Andy Dalton and securing Baltimore’s first shutout since Nov. 16, 2009, against Cleveland. But the day belonged to 34-year-old Terrell Suggs, who finished with six tackles, two sacks and a forced fumble. Instead of crowing about the fabulous play of the defense, the standout linebacker bemoaned the few plays in which the unit underperformed. Suggs said the defense is still a little upset about the bad things that happened. He was referring to a 27-yard completion to A.J. Green on a third-and-1 early in the fourth quarter. “That’s my guy,” Suggs said. Harbaugh will almost certainly point out each mistake to Suggs when the team reviews the film, simply because the goal is to get better every week. Suggs knows this too well. Coming off a back injury that kept him sidelined for the entire preseason, Ravens quarterback Joe Flacco didn’t complete any of his three passes in the second half. It wasn’t because he was ailing; rather, it was because he didn’t have to. “It’s a good way to win,” Harbaugh said. Cincinnati ran 58 plays, only a handful of which were effective. The Ravens next face the Browns, who opened their season with a 21-18 loss to Pittsburgh. Perhaps the only downer about Sunday’s frolic in Cincinnati was injuries to two key players: running back Danny Woodhead (hamstring) and backup linebacker Za’Darius Smith (knee). Harbaugh was awaiting the results of MRIs on both players, but said Woodhead’s injury involves “a timeline” and it did not appear as if Smith’s knee sustained structural damage. Lewis, Moss, Urlacher among first-year nominees for HOF-CANTON, Ohio (AP) — Star linebackers Ray Lewis and Brian Urlacher and game-breaking wide receiver Randy Moss are among 11 first-year eligible players for the Pro Football Hall of Fame. Also part of the 108 early nominees who are eligible for the first time, having been retired for five years when the class is chosen next February, are cornerback Ronde Barber, wideouts Donald Driver and Steve Smith (former Giant, Eagle and Ram), offensive linemen Steve Hutchinson, Matt Birk, and Jeff Saturday, and defensive linemen Richard Seymour and Kyle Vanden Bosch. Pagano considers QB change after opening day debacle-Indianapolis Colts coach Chuck Pagano kept replaying the season-opening rout in his mind Sunday night. Eventually, he went to the game tape, looking for something to soothe the embarrassment of a 46-9 loss to the Los Angeles Rams. Less than 24 hours after watching his team self-destruct, Pagano returned to the team complex with no new information about Andrew Luck’s expected return, a full-fledged quarterback controversy raging among the fan base and a different perspective about the possibility of a quarterback switch. “It’s something that we’ll discuss later tonight and into tomorrow as we game plan,” Pagano said Monday. All it took was one game to remind Colts fans of what happened six years ago. Back then, Peyton Manning sat out after undergoing multiple offseason neck surgeries so the Colts handed the starting job to veteran Kerry Collins. The season opener in Houston turned into an unmitigated disaster with Collins going 16 of 31 with 197 yards and one touchdown while losing two of three fumbles in a 34-7 loss. Collins kept the job two more weeks then never played another down in the league as the Colts staggered to a 0-13 record. The silver lining to that dreadful season: Indy earned the No. 1 draft pick and selected Luck. Now as Luck continues to recover from offseason surgery on his throwing shoulder and general manager Chris Ballard still urging caution about rushing Luck back, some worry it could be deja vu. Tolzien did nothing to assuage the growing concerns Sunday. He went 9 of 18 for 128 yards with no touchdowns and two interceptions — both returned for scores. In fact, Tolzien probably would have thrown a third pick-six if receiver Donte Moncrief hadn’t broken up the pass by grabbing the facemask of Rams defensive back Nickell Robey-Coleman. The combination of mistakes and the blowout finally prompted Pagano to pull Tolzien in the fourth quarter to give newcomer Jacoby Brissett a shot. Brissett was acquired in a trade with New England on Sept. 2 and spent most of last week trying to learn the playbook. Still, Brissett wound up going 2 of 3 for 51 yards with no turnovers. And it was a good enough performance to instigate a debate over whether Tolzien, who is 0-3-1 as an NFL starter, should be benched for this weekend’s home opener against the Cardinals. Tolzien and Brissett were not baited into that discussion Sunday and were not available Monday. Of course, there was plenty of blame to go around. Pro Bowl receiver T.Y. Hilton lost a fumble as he tried to gain extra yards. The offensive line allowed four sacks and Indy averaged 3.1 yards on 24 carries. The defense pitched in by letting Jared Goff throw for 306 yards and allowing the franchise’s highest opening-day point total since 1954 when the Rams shut them out 48-0. Even Adam Vinatieri struggled. He missed a 38-yard field goal in the third quarter and the Colts’ only extra point attempt in the fourth. Pagano blamed himself for not doing a good enough job — and not challenging a call on a first-quarter play on which the Colts appeared to score a touchdown. Instead, the officials ruled Marlon Mack stepped out at the Rams 1-yard line and Indy eventually settled for a field goal. Then again, it was that kind of a day. NOTES: Pagano said he should have waited another 25 to 30 seconds before running the goal-line play involving Mack rather than going with a quick snap. Even that might not have changed his mind, though. “I don’t think so,” he said. “Knowing what I know, I don’t think so.”… Pagano said center Ryan Kelly (foot) and cornerback Vontae Davis (groin) will continue to be listed as week to week. The Colts are hoping receiver Chester Rogers returns this week from a hamstring injury. … Rookie linebacker Anthony Walker (hamstring) was the only player injured significantly Sunday, Pagano said. … The Colts signed offensive tackle Tyreek Burwell to the practice squad. Another sluggish Seahawks opener brings up old questions-RENTON, Wash. (AP) — It took just a few minutes of the season opener against Green Bay for preseason fears about the Seattle Seahawks’ offensive line and its ability to protect quarterback Russell Wilson to re-emerge as legitimate concerns. There wasn’t much that Seattle’s offensive line dealt with well in the 17-9 loss to the Packers. It continued a trend of lackluster season-opening performances in recent seasons, although not all of them have been losses. Seattle is 3-3 in its past six season openers and has scored 16 points or less in four of those. But Sunday’s loss to the Packers revived all the concerns about the offensive line that Seattle had tried to downplay. Tackles Rees Odhiambo and Germain Ifedi struggled to keep pressure off Wilson from the edges, while Green Bay’s Mike Daniels was a problem for the interior of the line. Wilson was sacked three times, hit seven times and only when Seattle went with its hurry-up offense did the Seahawks find a rhythm. Seattle finished with 225 total yards and was 3 of 12 on third downs. Carroll was far from panicking. But he clearly wasn’t pleased with the performance. The offensive line wasn’t the only unit struggling on that side of the ball. Wilson missed a few open throws and tight end Jimmy Graham had an underwhelming performance. Graham was targeted seven times but made just three catches for 8 yards and had a critical third-down drop early in the fourth quarter. “It wasn’t his best game. He’ll do better. He was really disappointed on the ball that got away from him on the sideline,” Carroll said. While Carroll spent part of Monday trying to figure out ways to help the underperforming offense, he was also having conversations with the league about what led to the ejection of Jeremy Lane in the first quarter after he was deemed to have thrown a punch. No television replays showed a punch being thrown but rather Lane putting his arm on Davante Adams’ facemask after the pair tussled. Carroll said he agreed with the analysis from the TV broadcast that the punishment was harsh. “We have talked with the league and … I agree with the way the guys on television saw it,” he said. The opener also proved that Seattle’s defense should be every bit as good as expected. The Packers were held scoreless in the first half and one of the two touchdowns the Seahawks allowed came after Wilson fumbled at his own 6-yard line. Green Bay quarterback Aaron Rodgers threw for 311 yards, but Seattle was able to sack him four times. Newcomer Sheldon Richardson provided the kind of disruption Seattle hoped for from the interior of the defensive line and rookie Shaq Griffin played well after being thrust into a more prominent role after Lane’s ejection. “To hold that group down and not really let them take the ball down the field and score … they did a good job running, and hitting and covered well,” Carroll said. Mistake-prone Redskins are uneasy with McVay Rams up next-ASHBURN, Va. (AP) — Looking around at all the problems in their Week 1 loss, the Washington Redskins know they’re not in the preseason anymore. Exhibition sluggishness could be excused, but not now. The Redskins have good reason to be a little uneasy after three turnovers by quarterback Kirk Cousins, porous offensive-line play, an almost nonexistent running game combined with missed tackles and familiarly bad third-down defense on Sunday against Philadelphia. Even usually optimistic coach Jay Gruden was critical of several aspects of his team Monday before turning his attention to facing former offensive coordinator Sean McVay’s Los Angeles Rams. Taking over the play-calling from McVay, Gruden must establish Robert Kelley and the run game more than he did against the Eagles, when Washington attempted to pass on 72 percent of its offensive snaps. It would certainly help if tackles Trent Williams and Morgan Moses are 100 percent after ankle injuries, but even Gruden was surprised at how much the offensive line struggled. When Cousins is tied as the leading rusher with 30 yards on four carries, it’s not a good sign. Kelley averaged 3 yards on his 10 tries. The necessary next step is to make L.A. defensive coordinator Wade Phillips’ defense respect the run, which should help Cousins, who acknowledged he needs to be more accurate. McVay knows all about the Redskins’ strengths on offense, which makes Gruden’s job even more difficult as he tries to integrate Terrelle Pryor and second-year receiver Josh Doctson into the offense better. Doctson wasn’t targeted once during his 20 snaps in the opener, and Gruden said the 2016 first-round pick has to earn his playing time. The Redskins need Doctson to produce, but he’s not among their most glaring problems. Allowing Philadelphia to convert on 8 of its 14 third-down attempts is a continuation from last season, when Washington was worst in the NFL in that category, but at least Gruden has singled out specific concerns already this year. Cornerback Josh Norman said after the loss that the Redskins are “not hitting the panic button.” Of course after seeing McVay’s Rams beat up on the Indianapolis Colts 46-9, Gruden expects Sunday to be a significant challenge.